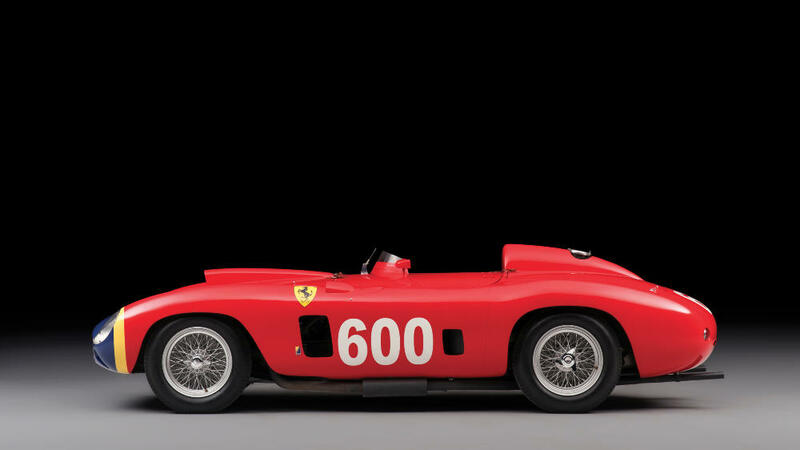 The 1956 Ferrari 290 MM raced by Fangio was at $28 million the most-expensive car sold at public auction in 2015. Six of the top-ten highest prices paid for classic cars at public auctions in 2015 were for Ferraris with Ferraris taking the top five slots. The barn-find 1961 Ferrari 250 GT SWB California Spider from the Baillon Collection that sold for $18,500,000 in Paris was the most-expensive car for most of the year but ultimately beaten to second place at the final major classic car auction of the year held by RM Sotheby’s in New York in mid-December 2015. The other four makes on the top-ten list – Aston Martin, McLaren, Jaguar and Porsche – all set new marque records and were the first cars of these manufacturers to have sold for more than $10 million. Only 28 cars have ever sold for more than $10 million at public auction – 10 of these cars were auctioned in 2015. The most-expensive car by far sold at public auction in 2015 was the 1956 Ferrari 290 MM by Scaglietti that achieved $28 million at the RM Sotheby’s Driven by Disruption sale in New York in mid-December 2015. This ex-Scuderia Ferrari works car was famously driven by Juan Manuel Fangio to fourth place at the Mille Miglia race in 1956. It was also driven in competition by amongst others Phil Hill, Marquis Alfonso de Portago, Peter Collins, Wolfgang von Trips, Masten Gregory, Eugenio Castelloti, and Luigi Musso. The 1961 Ferrari 250 GT SWB California Spider sold by Artcurial for $18.5 million set a new auction week record for the Paris classic car sales in early February. It also set a new auction record for a 250 GT SWB California Spider – the previous record was $15.2 million paid at the Gooding 2014 Pebble Beach sale. Only 37 short-wheel base Ferrari 250 GT California Spiders were made and this barn find is considered to be in the most original state (but will need significant work). It was part of the Baillon collection. A new model record was also set by the 1964 Ferrari 250 LM that RM Sotheby’s sold for $17,600,000 at the 2015 Monterey classic car auctions in mid-August. 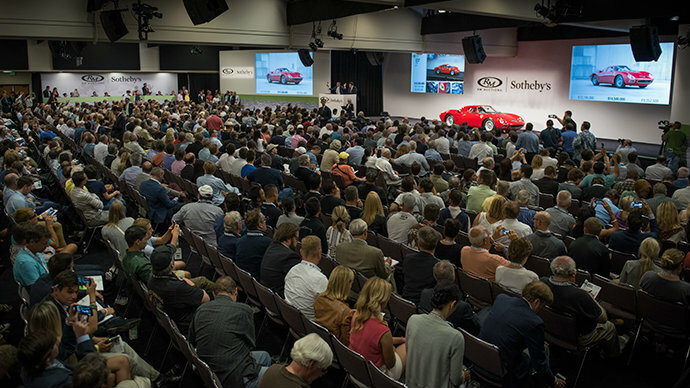 It was also the highest price achieved at Monterey this year, although the world record price of $38 million for the 1962 Ferrari 250 GTO set in 2014 still remains the Monterey auction week record. The 1964 Ferrari 250 LM was one of the cars sold as part of the Pinnacle Collection – 25 cars offered, of which 15 sold for more than a million dollars. Gooding achieved a strong $16,830,000 for a 1961 Ferrari 250 GT SWB California Spider in good, very original condition at the Pebble Beach auction. This car has never been fully restored or shown at major events making it a very attractive car for an owner interested in exhibiting this rare Ferrari. It was Gooding & Company’s best result of the year. A 1962 Ferrari 250 GT SWB Berlinetta Speciale was also sold by Gooding at the Pebble Beach auctions for a model record $16,500,000. This car has a unique bodywork designed by Giugiaro for Nuccio Bertone, who used it as his personal car. The car took the shark-nose racing cars of Ferrari as inspiration but failed to gain Bertone orders from Ferrari. The 1962 Aston Martin DB4 GT Zagato sold by RM Sotheby’s in New York for $14,300,000 is the most-expensive Aston Martin car ever. It also set a new record for a British car sold at public auction – smashing the record set at Monterey 2015 by a McLaren F1 sports car. Only 19 of the DB4 GT Zagato were produced for competing in the World Sports Car Championship. This car had a successful but very brief racing history in Australia and is in a very good, original condition. The second most-expensive car other than a Ferrari in 2015 was a McLaren F1 “LM-Specification” that set a new marque record when sold for $13,750,000 by RM Sotheby’s at the Monterey auction. This was the second last of the 63 road-going F1 cars made by McLaren and one of only two upgraded by the factory to Le Mans specification inspired by the cars that powered McLaren to victory at Le Mans in 1995. The car was the first British-made car ever to sell for more than $10 million at a public auction. A new marque record was also set for Jaguar when RM Sotheby’s sold at Monterey a 1953 Jaguar C-Type Works Lightweight for $13,200,000 – only the second British car to have achieved more than $10 million at public auction. This was the second of only three C-Type Jaguar works cars produced. It was placed fourth at Le Mans in 1953. The Jaguar was subsequently raced to victories and strong finishes by the Ecurie Ecosse team and later by privateers until the late 1950s. A 1956 Ferrari 250 GT SWB Berlinetta Competizione “Tour de France” by Scaglietti sold by RM Sotheby’s at Monterey took joint-eighth place with the Jaguar. This car won the 1956 Tour de France racing series and is the car that inspired the nomenclature Tour de France. This car was originally raced by the illustrious Marquis Alfonso de Portago – he also drove the 290 MM. Gooding set a new marque record when the 1982 Porsche 956 sold for $10,120,000 at Pebble Beach. It was also the first time ever that a Porsche car achieved over $10 million at a public auction. This is of course a very special Porsche: this 956 won the 1983 Le Mans 24 Hours race outright with Al Holbert / Hurley Haywood / Vern Schuppen. The previous year, the same car finished second behind a sister car while driven by Jochen Mass and Vern Schuppen. This 1982 Porsche 956 was only the third German car ever to have sold for more than $10 million at public auction. RM Sotheby’s is leading the battle of the auction houses with at least 110, followed by Bonhams with 54 and Gooding & Co with 44 (from only three auctions). Bonhams sold the most-expensive cars in both 2014 (1962/3 Ferrari 250 GTO) and 2013 (1955 Mercedes Benz W196R F1) but failed to sell a top-ten car in 2015 – its best result of the year was $9.4 million for a1966 Ferrari 275 GTB Competizione sold at Scottsdale. Artcurial had its first car on the list ever this year and may have a good start to 2016. Scottsdale & Arizona (mid-January 2015): RM Auctions, Gooding, Barrett Jackson, Bonhams, and Russo and Steele. Paris Sales (early February): Artcurial, Bonhams, and RM Auctions. Amelia Island (mid-March): Bonhams, Gooding, RM Sotheby’s. Mercedes Benz Museum (end March): Bonhams. The Andrews Collection Sale in Forth Worth, Texas (early May): RM Sotheby’s. Aston Martin Works Sale at Newport Pagnell (mid-May): Bonhams. Villa Erba Sale in Italy (end May): RM Sotheby’s.